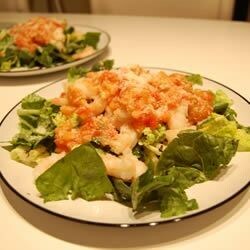 "Chopped tiger shrimp on a delicious blend of greens and herbs, drizzled with my own beer and tomato sauce!" Excellent! But I chop the shrimp large, not small. Followed the recipe precisely. VERY bitter. I think it was due to the fresh herbs. Had to add sugar to make it edible. Is definitely missing something. Won't be making this one again. I did a reduction of the beer first and omitted the flour. Excellent flavors. I only had red onion, but this was really yummy, will make this again!